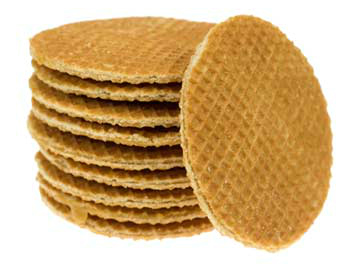 Say hallo to the stroopwafel! A liquid caramel-filled crunchy cookie that is so very Dutch. If you've ever been to the Netherlands, no doubt you've tasted these cookies of heaven. Foreign friends always beg for them. They're the complete package: sweet, salty caramel, soft inside, crunchy exterior, delicious texture, super yummy and surprisingly filling. They're always round with a waffle pattern. 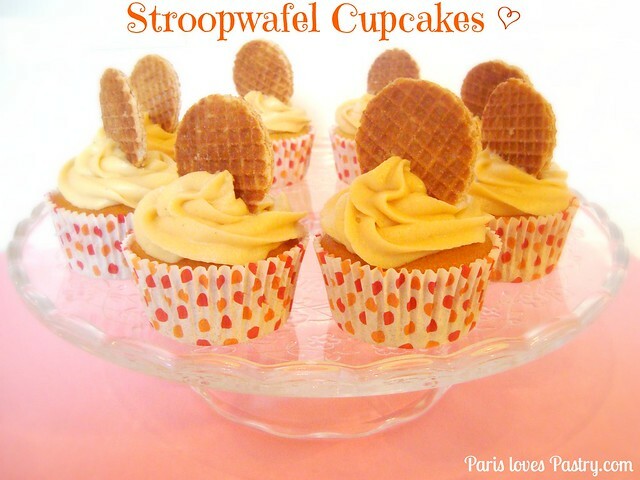 Making these into cupcakes is nothing new to Dutch (& non-Dutch) food bloggers. I first saw them on Lian's blog Cakeje van Eigen Deeg. And British sugar artist Astral from Buttercream Bakery was inspired to make them after a trip to Amsterdam. I am making them because the Holidays are nearing and I love to decorate cupcakes this time of year. Though originated in the Netherlands, I've noticed Starbucks is selling them in various countries and calling them 'caramel waffles'. I spotted 'caramel waffles' at Copenhagen airport and tasted a sample. Exactly the same! Hopefully they will be more available to other countries as well. Because as much as I love eating local food in a foreign country, it is always nice to enjoy some stroopwafels along the way! Rating: 4.5 out of 5. - In a small bowl, combine the flours and cinnamon. Set aside. - In a large bowl, on the medium speed of an electric mixer, cream the butter until smooth. Add the sugar gradually and beat until fluffy, about 3 minutes. Add the eggs, one at a time, and the caramel sauce and maple syrup, beating well after each addition. Add the dry ingredients in three parts, alternating with the milk. With each addition, beat until the ingredients are incorporated but do not overbeat. - In a medium-sized bowl with an electric mixer, combine all ingredients and beat thoroughly until there are no more lumps in the frosting. Add more milk if needed for your desired consistency. 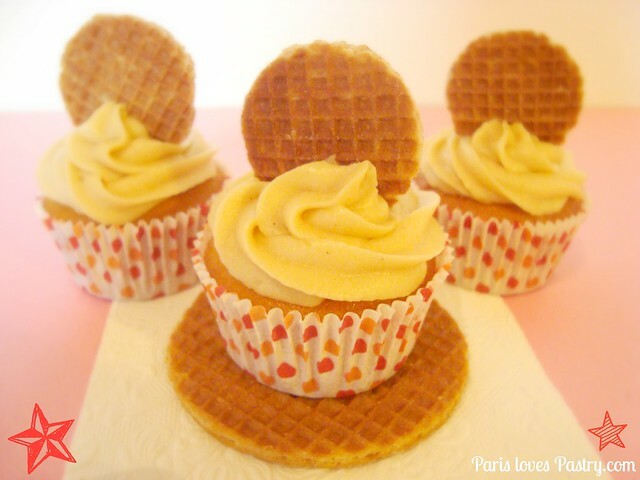 - Pipe the frosting onto the cupcakes and adorne the cupcakes with a mini Stroopwafel. waffle cookies makes a stroopwaffel! And something I always find fascinating: a 'before & after' photoshop collage! OMG!! You just made my day! I used to get these from Starbucks when I studied abroad in Spain a few years ago. I was so bummed when I couldn't find them here anywhere. I'm beyond excited to make them for myself. Thank you, thank you!! Really a lovely cupcake for the Christmas party.. and just love the recipe too..